The goats are serenely unaware of the fanged predator slinking ever closer to them. So is the herdsman. When the cheetah is close enough—maybe 50 yards from his prey—he will suddenly break cover, make a lethal dash at speeds that approach 70 mph, and sink his teeth into the neck of his chosen victim. It will all be over in seconds: one goat dead, the rest of the herd scattered in terror. But it’s not going to happen this time. The herdsman isn’t the only one guarding the goats. There’s also an Anatolian Shepherd dog, more than two feet tall and afraid of nothing. His keen nose gets a sudden whiff of leopard, he braces himself on all four paws, and begins barking fiercely. Spooked, the leopard turns and runs. Breakfast will have to wait. From time immemorial, Anatolian Shepherds have been bred for just one vital task: protecting isolated flocks in their windswept, mountainous Turkish homeland. They’re strong, fast, and independent, and they don’t back down—not even from wolves. That’s why in Namibia, in southwest Africa, Anatolians (along with another Turkish breed, the Kangal dog) are being used to keep cheetahs away from herds. And while they protect the livestock, they’re also saving the cheetahs from extinction. The idea behind the program, sponsored by the Cheetah Conservation Fund (cheetah.org) is that if a Shepherd’s barking can scare off a stalking cheetah, the herdsman guarding the flock won’t need to kill it. In addition to being the world’s fastest land mammal, the cheetah is one of the fastest-disappearing species on the planet. In just the last century, the worldwide wild cheetah population has declined by 90 percent, and they’re extinct in 20 countries they once inhabited. Only about 10,000 adult cheetahs are believed to remain in the wild, mainly in Africa’s southern and eastern regions (in addition to about 50 to 100 in Iran). Namibia is home to the largest and healthiest of the surviving cheetah populations. Although nature preserves can protect cheetahs from human depredation, they don’t prevent attacks from the larger, more aggressive predators, such as lions and -hyenas, which not only covet the animals the cheetah kills, but also prey on its cubs. To escape, the cheetahs are often forced to move to farmland areas, where they face fewer natural predators. But it’s precisely in those farming and herding areas that the cheetahs run the risk of being killed by people who regard them as simply a threat to their livestock.That’s where the Livestock Guarding Dog Program, the brainchild of Dr. Laurie Marker, CCF’s co-founder and executive director, comes into play. Trained not to attack or chase a predator, the guard dog stands its ground and barks—enough to scare off most predators and alert a farmer that his stock is in peril. And cheetahs, which are much smaller than other predators in the cat family, are not usually aggressive and will generally retreat from a barking dog. “The use of the Anatolian Shepherd program in Namibia has been significant in reducing cheetah removals from the farmlands,” Dr. Marker tells Cesar’s Way. Since 1994, the CCF has placed 260 of the broad-shouldered dogs, which stand two-and-a-half feet high and weigh on average 140 pounds, on farms. The farmers selected for the program are carefully screened and receive training on how to care for the dogs, says Patricia Tricorache, CCF’s assistant director of international relations. Once acclimated to its new surrounding, the dog lives, sleeps, and eats with the livestock. CCF representatives make routine visits to farms to check on the animals’ welfare. If they find that a Shepherd is not receiving the adequate care it deserves, it is taken back to CCF or placed with another farmer. And when the dogs get too old, they’re retired to CCF’s –Namibian headquarters to live out their days as pets. Laurie sul Corriere della Sera! Laurie sul Corriere della Sera!. MILANO – Di solito si dice «essere come cane e gatto» per indicare una relazione burrascosa. A volte, invece, può accadere, che proprio un cane diventi il salvatore di un felino. E in questo caso, di uno dei felini più antichi che esistono sulla Terra: il ghepardo, l’animale più veloce al mondo, che quando corre raggiunge i 110 chilometri orari. Succede in Namibia, alCheetah Conservation Fund, fondato dalla biologa americana Laurie Marker. MINACCIA ALLE MANDRIE – La dottoressa, ex direttrice di uno zoo negli Usa, dal 1990 vive in Namibia e si dedica alla conservazione di questi animali, che fino a qualche anno fa venivano sistematicamente abbattuti dagli allevatori locali di bovini, nel tentativo di proteggere le loro mandrie dagli attacchi. Questo e altri motivi, come l’inquinamento e la modifica degli habitat con la costruzione di numerose farm cintate, hanno provocato una strage di questi felini. Secondo l’associazione, tra il 1980 e il 1990 in Namibia sono stati uccisi circa 10 mila ghepardi e ora ne sopravvivono solo tremila. In tutta l’Africa all’inizio del 900 ne esistevano 100 mila, adesso non sono più di 10 mila. I CANI PASTORE – «Mi sono chiesta come fosse possibile ridurre il conflitto tra gli allevatori e i ghepardi. Occorreva e occorre tuttora un cambiamento economico, perché se la gente soffre la fame certo non può preoccuparsi della conservazione di questi animali – ricorda la Marker -. Cambiare la situazione economica, però, non era in nostro potere. Allora, abbiamo pensato di proteggere le mandrie dagli attacchi». Come? Addestrando dei cani, i pastori dell’Anatolia. La fondazione ne ha formati e distribuiti già 230 agli allevatori locali, stringendo anche degli accordi con loro. «Questi cani hanno la stessa dimensione dei ghepardi, sono coraggiosi e combattono fino alla morte. La loro presenza rassicura gli allevatori che così hanno smesso di uccidere. Molti di loro lo facevano senza neppure sapere il perché, ce lo hanno spiegato quando siamo andati a parlare con loro, bussando porta a porta» sottolinea la Marker. Oggi la fondazione non si occupa solo degli animali, ma fa anche formazione per gli agricoltori africani e ha creato anche posti di lavoro, in un paese, come la Namibia, dove la disoccupazione sfiora il 40 per cento. Nei laboratori si sono formati 400 biologi provenienti da 25 nazioni e ben 65 di loro sono namibiani. LA SCOMPARSA DEGLI HABITAT – Se l’accordo con gli allevatori sta dando i suoi effetti, restano però altri problemi da affrontare, come la scomparsa degli habitat. «Il ghepardo ha bisogno di una vasta zona di caccia, senza di essa non può sopravvivere. Inoltre, è un animale delicato, non si riproduce facilmente in cattività». Dei mille ghepardi oggi seguiti dal Cheetah Conservation Fund, solo 100 sono nati in cattività. La risposta a questo problema sono le “conservancies”, territori in cui proibire la caccia al ghepardo e in cui mantenere le condizioni ambientali in cui questo animale possa prosperare. Ed è questa la direzione in cui lavora la fondazione. Un’impresa non impossibile, se si pensa che la Namibia è una delle poche nazioni che ha fra i suoi obblighi costituzionali il mantenere e promuovere la convivenza fra animali e uomini. ANCHE SU FACEBOOK – «I ghepardi sono animali affascinanti, unici nel loro genere – sottolinea la biologa -. Ad esempio diversamente dagli altri felini, non hanno unghie retrattili e hanno comportamenti simili a quelli dei cani, ad esempio nel marcare il territorio». Per restituire l’habitat ai ghepardi, la fondazione ha assunto del personale per disboscare i rovi selvatici e con i tronchetti ottenere energia a biomasse. Grazie alla pulizia degli ecosistemi, anche la biodiversità sta migliorando. Per i suoi meriti, Laurie Marker è stata nominata “Hero’s for the planet” dalla rivistaTime. Per aiutare i ghepardi a sopravvivere oggi c’è anche un nuovo gioco online su Facebookpromosso dalla Sony per sostenere l’attività della fondazione. 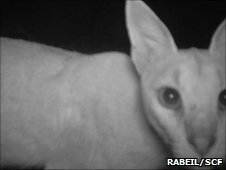 One of the world’s most elusive cats has been photographed by a night time camera trap, after a year-long search for the animal. 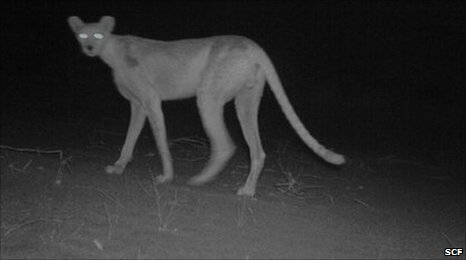 The ghostly image of the Saharan cheetah has excited conservationists, as perhaps fewer than 10 of the cats survive in the deserts of Termit, Niger, where the photograph was taken. Almost nothing is known of the Saharan cheetah, except that it endures extremely high temperatures and appears to survive without a permanent source of water. Scientists working for the Saharan Conservation Fund (SCF) took the image as part of the Saharan Carnivore Project, an effort launched in conjunction with the University of Oxford, UK, four years ago to research and document larger predators roaming one of the world’s most inhospitable habitats. These areas have become the most important remaining refuges for wildlife in the entire Sahara. Although conservationists have been working in or around the massif since 2000, they have only observed cheetahs there three times, and the cat has not been photographed. That was until a camera trap, set by SCF researchers, captured an eerie image of a Saharan cheetah passing by at night. “The cheetahs of Termit Massif are extremely shy, rarely revealing themselves to researchers and few visitors go there,” the SCF’s Thomas Rabeil told the BBC. Saharan cheetahs remain an enigma, even to scientists who specialise in studying rare cats. For example is it not yet known if Saharan cheetahs are more closely related to other cheetahs in Africa, or those living in Iran, which make up the last remaining wild population of Asiatic cheetahs. Saharan cheetahs appear to have different colour and spot patterns compared to common cheetahs that roam elsewhere in Africa. However, “very little is known about the behavioural differences between the two cheetahs, as they have never been studied in the wild,” says Dr Rabeil. Experts believe the Saharan cheetah has found a way to survive in a habitat where there is no permanent source of water. In doing so the animals endure exceptionally high summer temperatures. Attempts to track Saharan cheetahs also suggest that the cats roam considerable distances in a bid to hunt prey, which might include addax, dama and dorca gazelles or Barbary sheep. That makes finding and following the cats almost impossible. “Project personnel have gone to extraordinary lengths to try and observe these animals directly, resorting to extended surveys on camel-back,” Dr Rabeil told the BBC. “On one such eight-day journey recently a cheetah eluded researchers, leaving clearly identifiable tracks behind but changing direction and using the desert geography to maintain its enigmatic, elusive reputation,” he said. Saharan cheetahs are thought to range in six countries: Algeria, Togo, Niger, Mali, Benin, and Burkina Faso. But the total population may be fewer than 250 mature individuals. The first ever camera trap photograph of one was only taken last year in Algeria. More than 50 cheetahs are thought to live there, compared to 10 or fewer in Niger. A Melting Pot of Heritage, Culture, Palaces, Deserts & Festivals!